Joining other Catholic communities across the United States, Everest Collegiate High School & Academy celebrated National Vocations Awareness Week this past November 4-10 with opportunities for students to understand and appreciate in a deeper way the gift of vocations to priesthood and consecrated life. The school initiatives included inviting students to write down by name consecrated persons they would personally pray for. 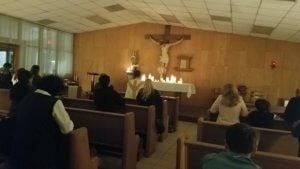 Individual classes were offered the opportunity to “adopt” a religious sister, priest, consecrated woman, seminarian, etc. – some of whom were even able to visit those classes in person. The students’ prayers were especially strengthened through the monthly adoration for priests held Wednesday evening, which several families from the school attended. Let us continue praying with the whole Church for many more men and women to answer God’s call with courage and true holiness of life; and let us also thank God for those people who serve us at school each day through their own “yes” to his calling! EC students wrote he name of someone they would pray for on banners in the stairwell. 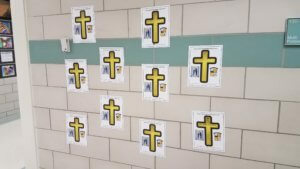 Each class in the academy signed a cross with names of those they were praying for during the week.